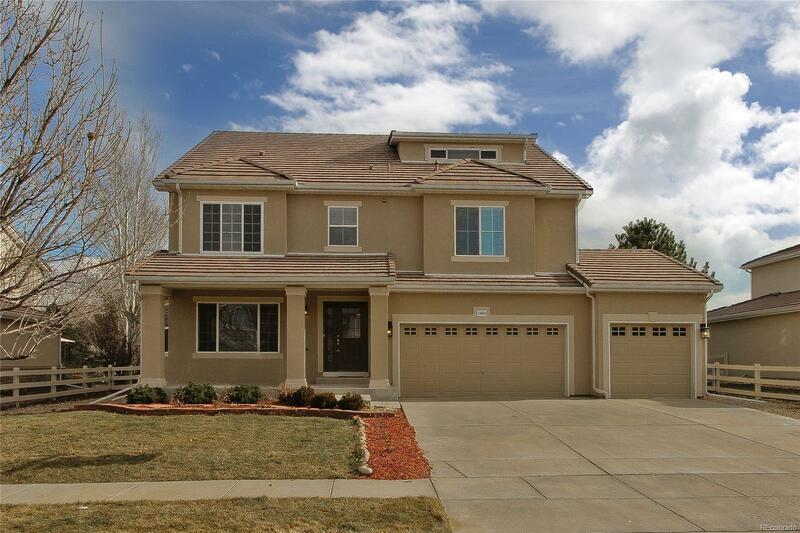 Completely remodeled home in the Broadlands golf community with 5 bedrooms, 3.5 baths and an office. Modern kitchen with white shaker cabinets, white quartz and glass subway tile backsplash. Bosch appliances including double wall oven. 36â gas cooktop with wall hood. Kitchen island with seating for 5. Hand-scraped engineered hardwood floors on main level. Large open concept family room with gas fireplace. Private, fully fenced back yard with stamped concrete patio. Huge master suite with balcony, 5-piece bath with custom tile work, large shower with body sprayers and jetted tub. His and her closets with built-in shelving. Second level with 4 bedrooms all with walk-in closets and a loft area with a wet bar. Third level flex space â perfect for home theater, play room, studio, etc. Finished basement can be an in-law suite, guest suite or play room/man cave. House is walking distance to elementary school and park. Community pool and clubhouse and many neighborhood trails and parks.